My name is Matt Nolan. 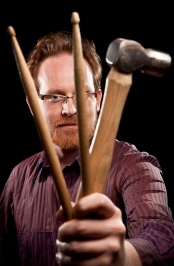 I work metals with hammers, anvils and fire to create fine musical instruments – percussion instruments such as cymbals, gongs, tam-tams, triangles and other things. I create sounds. I make instruments for drummers, percussionists, composers, symphony orchestras, touring and recording artists and art collectors from all over the world. I also work as a consultant on cross-disciplinary projects. I try to make my instruments as much "by hand" as possible as I believe this gives them the most character and range of expression. I make them one at a time in my workshop in the city of Bath in the south-west of England. I construct many of my own tools so that they are perfectly tuned for the job. My instruments range from the traditional to the innovative. Some of my designs have become lines that I reproduce frequently, while others are true one-of-a-kind instruments. Explore my current and previous works using the links on the left. Are you searching for a unique voice? Perhaps the next thing I make will be for you.